Triton women record second consecutive eighth-place NCAA Tournament finish. 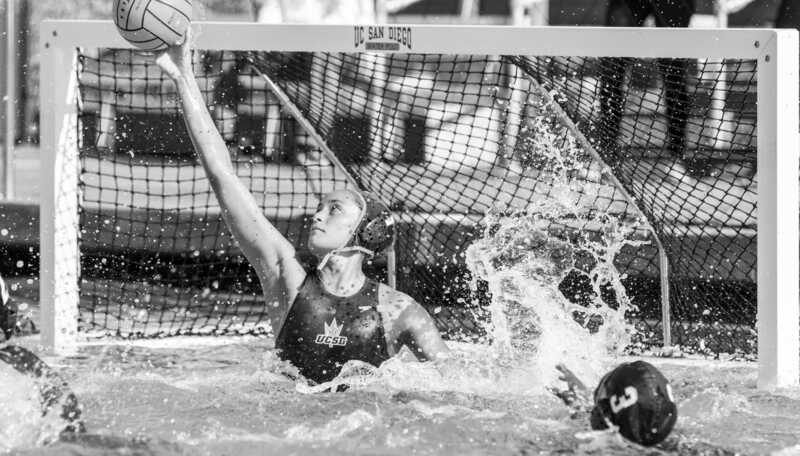 This past weekend, UCSD women’s water polo competed in the 2015 National Collegiate Women’s Water Polo Championship at Stanford University’s Avery Aquatic Center. The squad eventually placed eighth after it suffered consecutive losses to No.1 UCLA, No. 6 UC Irvine and No. 5 University of Hawaii. The weekend started on Friday, with No. 20 UCSD facing UCLA in the first round. Junior goalkeeper Courtney Miller led the Triton squad with an impressive total of 15 blocks, but despite her best efforts, UCSD ended up falling to the top seed with a final score of 9–2. Senior attacker Jolene Guiliana scored both of UCSD’s goals. This loss pushed UCSD to a 19–19 record on the season while UCLA improved to 25–2. During the game, the Bruins came out swinging, winning the sprint and capitalizing on the earned opportunity by scoring on their first possession. The Tritons were able to tie up the game to 1–1 relatively quickly, courtesy of a brilliant play stemming off sophomore center Lauren Boyer’s 51st exclusion of the season and an assist from junior attacker Laurel Kistler to Guiliana. However, the Bruins retaliated, scoring three more goals in the quarter. The rest of the half didn’t fare much better for the Tritons, with the half ending in a 7–1 Bruins lead. In the second half, Miller was the shining star for the Tritons as she held the Bruins to only two goals scored. Guiliana was able to score the final goal for the Tritons in the third quarter before the deal was sealed, and the final score resulted in a 9–2 Bruins win. UCLA moved on to play UC Berkeley while UCSD went on to play UC Irvine in a consolation game the following Saturday. UCSD was not able to make up for the loss the following day against the No. 6 seed Anteaters. Encumbered by offensive fouls, UCSD could not hold on to an early lead, resulting in a final score of 13–8 in favor of UC Irvine. The results of the consolation round led to UCSD falling to a 19–20 overall record, with UC Irvine improving to a 20–9 overall record. The match started off well for the Tritons as Guiliana was able to score off an assist from Kistler in the opening minutes. Though UC Irvine responded with an equalizer, UCSD maintained the momentum throughout the rest of the quarter. Sophomore attacker Lani Tittle was able to put UCSD ahead with an assist from Guiliana. Kistler then scored another goal, followed with one goal from UC Irvine, ending the first quarter closely at 4–2, in favor of UCSD. The Anteaters were able to mount a comeback in the second quarter as they were able to score four goals while the Tritons could only put forth two — one from Tittle and one from junior attacker Emma Sasson — to end the half at a tie at 6–6. The Tritons faced trouble in the third quarter, however, as the Anteaters put out another four goals while the Tritons were kept scoreless, ending 10–6 in favor of the Anteaters. The game got out of reach in the fourth quarter, when the Anteaters were able to score two goals in less than 32 seconds. Though the Tritons were also able to score twice, they were just too far behind at this point to catch up and eventually fell to UC Irvine 13–8. UCSD competed the following Sunday against University of Hawaii for the seventh place slot after No. 5 Hawaii fell 7–6 to Princeton on Saturday. The Tritons were able to start off the game on a hot streak as they scored five goals in the first quarter. The scorers of the quarter included junior attacker Julia Kirkland, Kistler, Boyer and Tittle. Miller was also able to showcase her abilities by blocking a penalty shot. The quarter ended on a high note for the blue and gold as they led the count 5–2. The Rainbow Wahine came back strong in the second quarter as they scored four unanswered goals. The Tritons were only able to produce one goal from Kistler,and this led to the first half ending on a tie-game with a score of 6–6, uncannily similar to the score from the previous game against UC Irvine. The second half was when the University of Hawaii was able to distance itself from the Tritons as it got separation after scoring six goals in the third quarter. The Tritons were only able to score one goal from Boyer, assisted by Guiliana. The third quarter ended with the Rainbow Wahine up 12–7. The Tritons opened the fourth quarter up with another goal, but were unfortunately unable to score any more points after that. Miller, who finished the game with a stellar 10 stops, kept the Rainbow Wahine to only one goal in the final quarter. Even so, the damage had been done and the Rainbow Wahine defeated the Tritons with a final score of 13–8. UCSD ended the NCAA championship in eighth place and ended the season with a 19–21 overall record while the University of Hawaii was able to produce a 19–10 record. Kistler was honored as the only Triton to earn NCAA All-Tournament honors as she was placed on the Second Team. This was the first time that Kistler has been awarded with such honors. This marks the second consecutive year that UCSD finished the NCAA championships in the eighth position.